Squarespace included 4 different plan starts from $16 per month (or buy the annual plan for discount $12/month, that is you pay $144/year) to $480/year. Squarespace pricing is costlier than other website builders. But it doesn’t mean Squarespace provide you more features than Wix or SiteGround-WordPress. In fact, its features are less advanced and not reliable for most of the categories. Probably Squarespace is costly because it is located on the NewYork. That is the costliest area in the world and it hires employees from there by giving high salaries to average skilled people. 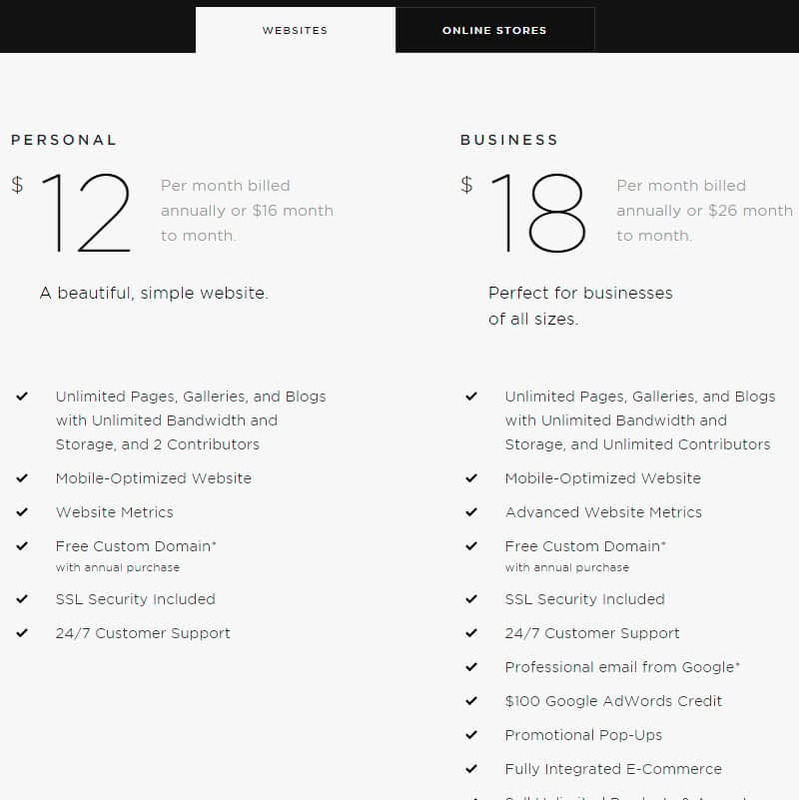 Here is the quick view of Squarespace plan & pricing. Only 20 pages..! If you purchase this plan, you need to finish the whole website within 20 pages. (It includes, blogs, galleries, and everything) It is too costly if you compare with our other top website builders. 24/7 customer support. But This is not true from our experience & others opinions. You need to wait for more than 20 minutes. Sometimes you don’t get any answers. If you submit a ticket, then you may get after a few days. Fully Integrated E-Commerce. You can sell unlimited products. (I will not appreciate it. Because every website builder will allow you to sell unlimited with more cheaper rates than Squarespace) But you need to pay 3% transaction fee for every sale. Also, it is not included in credit card processor fees..! Unlimited pages, galleries,bandwidth & storage. But it is not true. You can’t get unlimited storage & bandwidth. If your storage nearly 20GB then you can’t upload easily. Most of the times you will get upload failed messages. If your website gets nearly 8,000 visitors/month, your website will load very slowly and most of the time DNS error & session expire etc surprising errors messages you will get..!! For $216 per year price, Mobile Optimized perfection is not reached its value. Templates are responsive but not perfectly responsive. Most of the features can’t work with mobiles. If you pay $12/month. then you should compromise with their minor mistakes, but if you pay $18/month, that is $216 per year, then you should not compromise for that mistakes. Because you can get so many great mobile-optimized themes for this price from other website builders. For business, you need advanced A/B testing and stats and report. Squarespace report are soo immature, you cannot able to take the right decision. You need to rely on Google analytics for basic stats. Even for business plan, the support is not good enough like Siteground-Wordpress. Here is Squarespace plan feature list.